Do you have a favorite kind of smoothie? Well, I do and this is it! 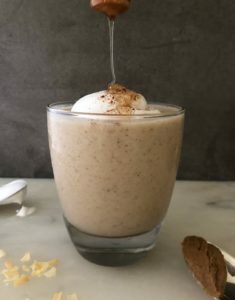 This banana almond butter smoothie is super tasty and the coconut whipped cream tops it all off. It’s the perfect treat without feeling guilty; I often make this when I am craving something on the sweeter creamier side. The ripe banana has a natural sweetness and the addition of honey also adds to that. 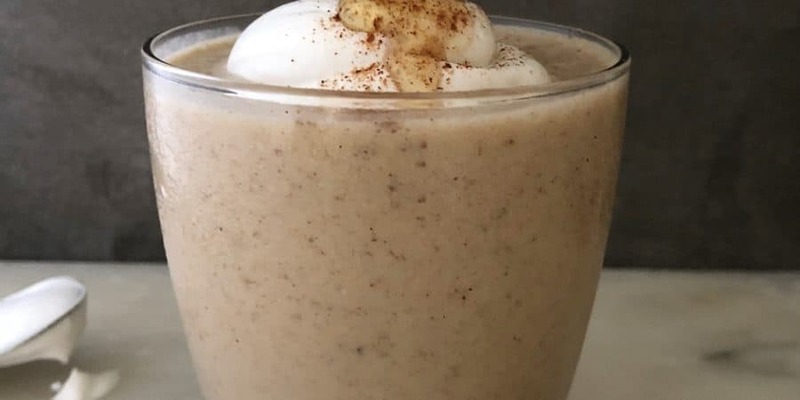 It is also an awesome smoothie to start your day with! The chia seeds and flax seeds add fiber to your diet, and the natural sugars will give you a boost of energy for the day. Place all the ingredients in a blender and blend until silky smooth. This should take less than a minute. In a chilled bowl, add the top thick creamy part of the coconut milk can. Also, make sure the whisk attachment is chilled as well. Everything must be chilled in order for this to develop into a whipped cream. Whisk on medium to high speed for about 4-6 minutes till soft peaks are formed. Top it off with a spoonful of coconut whipped cream and a sprinkle of cinnamon. Enjoy! !